The office of the Engineering Aide is an integral part of the Administration Department. 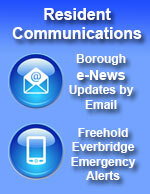 The Engineering Aide is responsible for the construction and maintenance of the sidewalks in the Borough. He issues permits for street openings and driveway apron construction. As the Borough’s Recycling Coordinator, he oversees the collection of trash and recycling throughout the Borough. He serves as liaison to the Borough Shade Tree Commission which is responsible for the proper planting and maintenance of trees throughout town, and assisting residents with any concerns they may have regarding Borough trees.